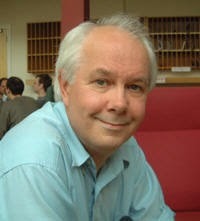 Ian Stewart recently retired as Professor of Mathematics at Warwick University and is a Fellow of the Royal Society. As an active research mathematician he published over 140 papers, but he is probably best known as a populariser of maths in a wide range of approachable books, and as co-author of the Science of Discworld books. His most recent title is Cows in the Maze. Short answer: it’s what I do. Longer answer: although most people would probably deny it, maths is a fascinating subject and it’s very suited to popularisation. Because few of us realise this, there’s not as much competition as there would be in, say, cookery books. So the field is wide open to those few writers who can spot the right topics and put together something that non-specialists can understand. Yes, but: why do I think maths is fascinating and suited to popularisation? Maths is useful. It relates to so many different aspects of our lives and our world. Maths underlies almost every aspect of modern technology – without a huge amount of maths, we wouldn’t have the Internet, mobile phones, CDs, DVDs, special effects in movies, Sat-Nav, petrol, radio, TV, radar, space flight, fuel-efficient cars, whatever. Maths is the main tool that scientists use to understand nature. Much of what we know about the planets, the interior of the Earth, the movement of the oceans, the weather, the patterns made by sand dunes, or the way animals walk, comes from maths. Maths is – well, can be – beautiful. Utilitarian maths, which is a lot of what we are taught in school, isn’t the best place to appreciate the beauty, though. The most beautiful aspects are usually on the research frontiers of advanced mathematics, like topology, ‘rubber sheet geometry’, where shapes can be stretched and bent, but not torn. Topology deals with things like knots and links. Or group theory, the mathematics of symmetry, which tells us that there are precisely 17 fundamentally different types of wallpaper pattern. Or dynamics, with the wonders of fractal geometry and chaos. When I was at school, I was a great fan of the American journalist Martin Gardner, who wrote a monthly column about Mathematical Games in Scientific American magazine. Each month he chose a new, usually slightly quirky topic, and explained it in very clear and simple terms. It opened my eyes, and those of many others, to the enormous breadth of mathematics. And it showed that maths can be fun. In 1990 I became the fourth person to write the column, and continued in that role until 2001. And before that I wrote a similar column for the French edition of the magazine. I racked up over 140 articles in total, and it seemed a shame to let them decompose slowly in my filing cabinets. So over the years I’ve been putting together updated collections of the columns. I think the main message of the book is that maths has many more connections with the real world than we tend to imagine. It’s also easier to understand if you focus on the big story behind the maths, rather than on the nuts and bolts of how to do it. I’m not in the education business. I’m not exactly in the entertainment business either. I like to think I’m in the awareness business, which is somewhere in between – or a bit of both. 100% of each, perhaps. Right now I’m about half way through writing a popular science book on mathematics in biology. The two subjects used to maintain a fairly distant relationship, but nowadays it’s become clear that many problems in biology need a lot of mathematical input. And the mathematicians are getting wonderful new problems from biology. For instance, mathematical models of the evolution of new species. I’m also working on a sequel to Professor Stewart’s Cabinet of Mathematical Curiosities and Professor Stewart’s Hoard of Mathematical Treasures. Three is a good number for a trilogy. …and just possibly there might be another Science of Discworld book with Terry Pratchett and Jack Cohen. It will be fun if we can manage it. I retired in October 2009, which should have given me all sorts of extra spare time to do all the things I’ve always wanted to do. Actually, life seems very much as it was, mostly because I was already doing all the things I’ve always wanted to do. But now it’s voluntary. So I know I’m doing it because I really want to. My wife Avril and I have been travelling – about one major trip a year plus a few smaller ones. We’re working our way through the list of places we’ve always wanted to visit. Easter Island, the Galapagos, Peru. Next on the agenda are Cambodia, Laos, and Vietnam. I’m still doing maths research: right now, I’m finishing off two long papers about networks. I expected to spend about six months on one short paper; it’s taken four years so far and there are now two long ones. The problem proved to be far more challenging (therefore more interesting) than I’d expected. One really exciting prospect is that one of my books might end up as a TV documentary. We’re discussing that right now. But for the usual reasons I can’t reveal which one.